The National Hockey League announced today that the Dallas Stars will face-off against the Nashville Predators in the 2020 Bridgestone NHL Winter Classic®. 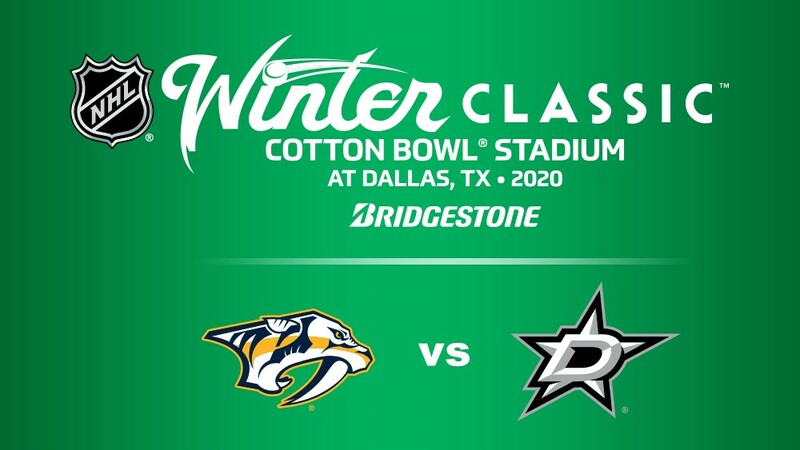 Earlier this month, the NHL announced that the Dallas Stars would host the 2020 Bridgestone NHL Winter Classic® at Cotton Bowl Stadium in Dallas, Texas, on Jan. 1, 2020; today the League announced the Predators as the Stars' opponent for the outdoor game. The 2020 Bridgestone NHL Winter Classic® will mark the first NHL regular-season outdoor game for both the Stars and the Predators. The game continues the tradition the League established in 2008 of hosting a regular-season outdoor game at the onset of the new year, with the 2020 edition marking the 12-year anniversary of the first NHL Winter Classic in Buffalo. Located just east of downtown Dallas, the historic Cotton Bowl® Stadium becomes the sixth football stadium to host the NHL Winter Classic. Cotton Bowl® Stadium is the third college football venue to host the game, joining Michigan Stadium (2014) and Notre Dame Stadium (2019). From 1937 to 2009, the venue hosted the Cotton Bowl® Classic, an annual NCAA Division I bowl game. Since 1932, the annual University of Texas/University of Oklahoma "Red River Showdown" football game has been held at Cotton Bowl® Stadium during the State Fair of Texas. Along with college football, the stadium has served as the home field for the Dallas Cowboys of the National Football League and the Dallas Texans of the American Football League. Both the Southern Methodist University Mustangs football team and FC Dallas of Major League Soccer have called Cotton Bowl® Stadium home on several occasions. Cotton Bowl® Stadium also served as a venue for the 1994 FIFA World Cup, one of nine stadiums in the United States selected to host matches during the international event. Bridgestone, the Official Tire of the NHL® and NHLPA, returns as title sponsor for the 11th consecutive year. The Bridgestone NHL Winter Classic® has become a tentpole hockey event on the North American sporting calendar. The 2020 Bridgestone NHL Winter Classic® will showcase a host of the top talent in the NHL. The Stars are led by captain Jamie Benn, forward Tyler Seguin, goaltender Ben Bishop and 2019 NHL All-Star Miro Heiskanen. The Predators counter with 2019 NHL All-Stars Roman Josi and goaltender Pekka Rinne, as well as Norris Trophy winning defenseman P.K. Subban and forward Ryan Johansen. The Stars won the Stanley Cup® in 1999 and returned to the Stanley Cup® Final in 2000, where they were defeated by the New Jersey Devils in six games. Nashville made the Stanley Cup® Final in 2017, where they were defeated by the Pittsburgh Penguins in six games. The Stars and Predators have earned the Presidents' Trophy a combined three times as the club that finishes the regular season with the best overall record (DAL 1997-98 and 1998-99; NSH 2017-18). The two franchises have had 81 regular-season meetings, with the Stars holding a 15-point edge over the Predators since the 1998-1999 season (Dallas 44-32-5 - 93, Nashville 36-39-6 - 78). The teams have split a pair of games this season (Nov. 10 -- NSH 5, DAL 4 (OT); Dec. 27 -- DAL 2, NSH 0), and have three remaining meetings, all in the month of February (Feb. 2 and Feb. 7 in Nashville, Feb. 19 in Dallas). Additional details relating to the 2020 Bridgestone NHL Winter Classic®, including ticketing and broadcast information, will be released at a future date. Fans can sign up for news and information on all of the NHL's events at www.NHL.com/events.